The very popular ‘Paper by FiftyThree‘ app was updated this week. It’s the electronic paper books app that has received a lot of attention due to it’s clean and effect user experience. Everything in Paper works like you expect so it’s an app that gets used and talked about a lot. Please note, there is two apps called ‘Paper’, we are talking about ‘Paper by FiftyThree‘ in this post. Those of you using Paper by FiftyThree now may have noticed in the above screenshot the addition of a large round dark area next to the color picker. That is another feature added in this update, Mixer. As the name implies, you use the circle area to mix colors to create your own color palettes. A very handy feature if your going beyond simple drawings with generalized shading. 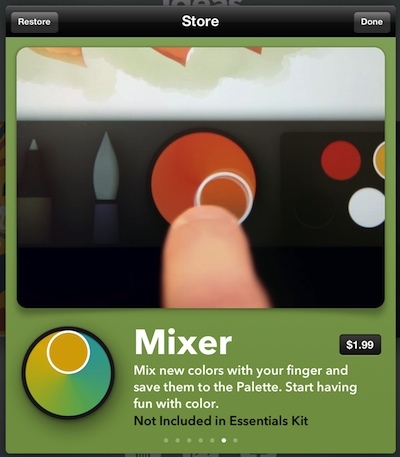 The Mixer feature is not included for free like the new palettes we showed above. A less visible change in the update is Paper by FiftyThree now supports the pressure sensitive pen Pogo Connect. Turning this on is via the ’53’ button when your viewing the overview page of your notebooks. 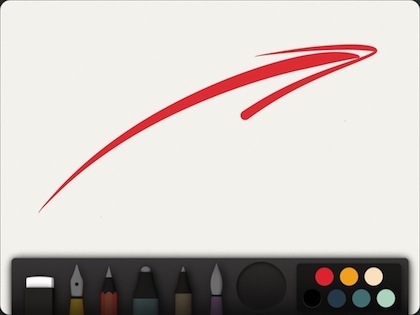 So, what is Paper by FiftyThree being used for? Two areas came to the front. A lot of the middle level talented folks do sketches with light shading which they use in Web articles. The app is very quick to do a natural looking sketch, add a bit of highlights and save off to be inserted into a online post. No need to draw on paper, clean up, scan and adjust. The app’s real time interaction of the stylus on digital paper makes the whole process much more natural for those used to sketching on a paper notebook. The other use that came out of the chats is for ‘the rest of us’ as someone said with a chuckle. When talking through a solution, either on paper or whiteboard, what really get the message home is little drawings instead of just text. Paper by FiftyThree has become the tool of choice to practice those little pictures. As with the more talented ones in our group, the instant stylus-to-screen action and correct ‘ink’ actions means it is a great place to practice. If your not familiar with the concept, check out The Back of the Napkin or The Graphic Facilitator’s Guide. 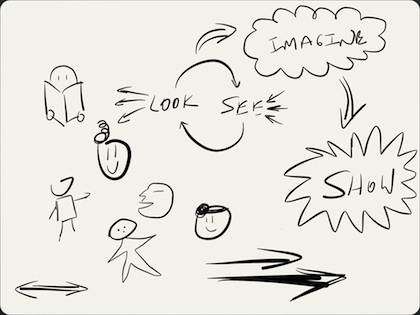 Both explain nicely how to use simple drawings to drive the idea home.